ISLAMABAD:(APS) April 27,2018-A relief loaded and growth oriented federal budget for the next fiscal year with an outlay of 5246 billion rupees has been announced. Minister for Finance Miftah Ismail presented budgetary proposals at the National Assembly today (Friday). The federal gross revenue receipts are estimated at 5661 billion rupees as compared to 4992 billion rupees in the outgoing year. This includes FBR’s tax estimates of 4435 billion rupees as against revised estimates of 3935 billion rupees for the current financial year. Out of the total revenues, the provincial governments’ share is estimated to 2590 billion rupees as compared to 2316 billion rupees revised estimates for the current financial year. After transfer to the provincial governments, the net revenue of the federal government is estimated at 3070 billion rupees for the next year as compared to revised estimates of 2676 billion rupees in the current financial year. The interest payments for next year have been budgeted at 1620 billion rupees against the revised target of 1526 billion rupees for the outgoing year. The defense budget is proposed at 1100 billion rupees against the revised budget of 999 billion rupees in the outgoing year. Budget deficit will be four point nine percent of the GDP as opposed to five point five percent of GDP of revised budget estimates in the outgoing year. The Finance Minister announced ten percent ad-hoc relief allowance to the civil and armed forces employees and ten percent increase in pensions across the board. House rent ceiling and house rent allowance have also been increased by fifty percent each. Minimum pension is being increased from the existing six thousand to ten thousand rupees considering the difficulties of low paid pensioners. Similarly, family pension would also get increase from 4500 rupees to 7500 rupees. Minimum pension of pensioners above seventy five years of age would be fifteen thousand rupees. The government has also proposed an allocation of twelve billion rupees for provision of advances to government servants for house building and purchase of transport facility. It has also set aside five billion rupees for senior officers’ performance allowance, details of which would be announced separately. Over time allowance of staff car drivers and dispatch riders is being increased from forty rupee per hour to eighty rupee per hour. The finance minister said the financial impact of these proposals will be sixty nine billion rupees. Finance Minister said budgetary allocations for Benazir Income Support Program (BISP) for the next financial year have been increased to 124.7 billion rupees as against 121 billion rupees in the outgoing year. The Minister said government has launched a national poverty graduation program for BISP beneficiaries with more than nine point five billion rupees. Under this program beneficiaries willing to start their own businesses will be provided with a one-time cash grant of fifty thousand rupees to start their own business. Miftah Ismail said that 688 million rupees are being allocated for Pakistan Poverty Alleviation Fund. He said the scheme launched by PML (N) government in 1991 to pay the loans of widow borrowers from house building finance corporation up to the value of 3.5 lac rupees would continue next year with an increased limit of six hundred thousand rupees. Miftah Ismail also announced several relief measures for agriculture, dairy and poultry sectors. These include withdrawal of three per cent custom duty on import of bulls meant for breeding purposes. Concessionary rate of customs duty on the import of feeds meant for livestock sector is being reduced from ten percent to five percent and fans meant for use in dairy farms be allowed a concessionary rate of three percent to members of corporate dairy association. This will substantially reduce their cost of inputs and boost further expansion in respect of poultry sector. The government announced that the rate of customs duty of eleven percent on corrective eyesight glasses would be reduced to three percent. The Finance Minister announced that enabling provisions are proposed to be incorporated in the income tax ordinance to implement property transactions. Under the proposals, property transactions will be recorded on the value declared by the buyer and the seller and FBR notified rates are proposed to be abolished. At the federal level, one percent adjustable advance tax from the purchaser on the declared value is proposed to replace the existing withholding tax on sellers and purchasers. It is proposed that the non-filers may not be permitted to purchase property having declared value exceeding four million rupees. The provinces have been asked to abolish the provincial rates for the collection of stamp duty and to collect a total of one percent tax under stamp duty and capital value tax on the value declared by the buyer and the seller. To discourage under declaration, the FBR may hold a right to purchase any property within six months of registration by paying a certain amount over and above the declared value which may be hundred percent in the next fiscal year, seventy five percent in the following year and fifty percent in the subsequent year. The Finance Minister said due to enhancement of taxable limit of income to one point two billion rupees, the number of filers will be substantially reduced leading to loss of revenue. He said a nominal income tax of one thousand rupees would be imposed for income between four hundred thousand to eight hundred thousand, and two thousand rupees for income between eight hundred thousand to one point two million rupees. Miftah Ismail said the super tax imposed in 2015 for rehabilitation of internally displaced persons would continue but its rate may be reduced by one percent per year from the next financial year for both banking and non-banking companies. Finance Minister said the government has decided to reduce corporate tax rates from thirty percent in tax year 2018 to twenty five percent in tax year 2023. The corporate tax rate would be twenty nine percent in tax year 2019 and will be reduced by one percent each year up to tax year 2023. Tax rate on undistributed profits would be reduced from seven point five percent to five percent and the condition of distributing forty percent after tax profit may be reduced to twenty percent. Presently, zero point six percent tax is charged on non-cash banking transactions from non-filers which is being reduced to zero point four percent on a permanent basis. The Finance Minister said in order to increase the cost of doing business higher for non-filers higher rates of tax withholding for non-compliant tax payers have been proposed. 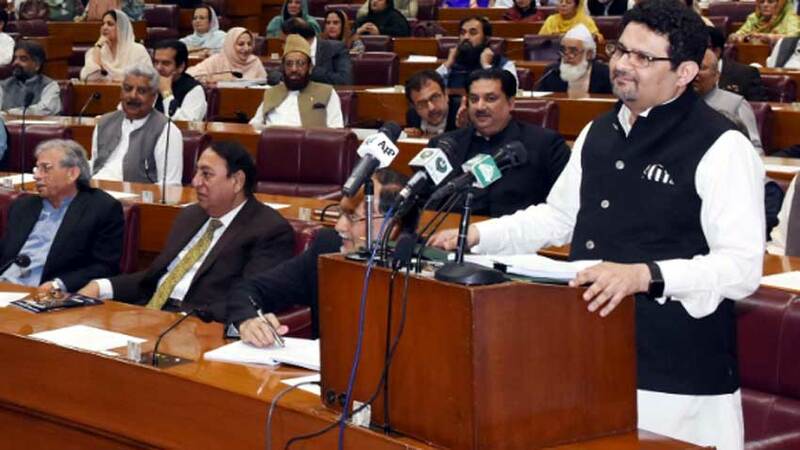 Miftah Ismail said withholding tax rates on sales of goods for non-filers would be increased from existing seven per cent to eight percent in case of a company and seven point seven five per cent to nine per cent in non-corporate cases. He announced exemption from sales tax and customs duty on paper for printing of holy Quran. With a view to promoting agricultural growth, reduction in rate of sales tax to three per cent across the board on all fertilizers has been proposed. It has also been proposed that the rate of sales tax of ten percent on supply of natural gas to fertilizers for use as feed stock may be reduced to five percent. The budget proposes exemption from sales tax to twenty one types of computer parts in order to promote local assembling and manufacturing of laptops and computers. It has been proposed that zero rating for stationery may be restored to promote local stationary sector and reduce the prices of local stationery prices. Rate of further tax has been increased from the existing two to three percent to discourage undocumented economy and increase in revenue. Federal excise duty on locally produced cigarettes is proposed to be enhanced. The Finance Minister said that sixteen percent customs duty on charging stations for electric vehicles will be withdrawn while customs duty on import of electric cars is proposed to be reduced from fifty percent to twenty five percent in addition to exemption from regulatory duty of fifteen percent. He said import of CKD kits for assembly of domestically produced electric cars is proposed at ten percent. Similarly, five percent customs duty on specified LED parts and components is proposed to be withdrawn. For promotion of tourism, Miftah Ismail said customs duty on import of prefabricated structures, complete rooms for setting up of new hotels and motels in hill stations of coastal areas of Balochistan and AJK and Gilgit Baltistan will be reduced from twenty percent to eleven percent. Regulatory duty on import of optical fibre cable is to be reduced from twenty percent to ten percent while duty on fiber optic cable and other raw material would be reduced to five percent. The government has proposed setting up an agriculture research support fund with an initial allocation of five billion rupees. The fund will provide financial grants for research and development of modern plant and seed varieties for achieving higher crop yields. Miftah Ismail said the government is also proposing to establish a separate fund for indigenization of agriculture technology with an initial allocation of five billion rupees. The Finance Minister said tariff subsidy on agriculture tube wells will continue in areas where the provincial governments agree to share cost of subsidy on fifty fifty basis. He said Ministry of National Food Security and Research is working on a plan for restructuring and revamping of research organizations to convert them into state of the art platforms for research and development. The Finance Minister announced a fiscal incentive package for revival of film industry. It envisages reduction in customs duty to three percent on import of film and drama production equipment and sales tax to five percent. A revolving fund would be established for promotion of film and drama industry and to provide financial support to deserving artists. There will be a rebate of fifty percent in income tax for five years to companies investing in film projects. There will also be fifty percent tax rebate to income derived by foreign film makers from films made in Pakistan. The Finance Minister also announced a new scheme of sea water desalination plant for Karachi to solve its long standing severe water crisis. The plant to be built by the private sector will produce fifty million gallons of water per day. An allocation of five billion rupees is being proposed in the next year’s budget under Prime Minister’s package for Karachi. The overall size of National Development Outlay for the next financial year is 2043 billion rupees, with a foreign assistance component of 339 billion rupees. This is the highest ever outlay in the history of the country, reflecting commitment of the government for steering greater development. The size of the federal public sector development program is 1030 billion rupees, while that of provincial Annual Development Plans is 1013 billion rupees. CPEC related projects have been assigned highest priority for their timely completion. Water, energy and transport projects have also been given priority to attract domestic and foreign investment. For the first time, innovative mode of public-private partnership has also been initiated in the PSDP. This will help in making development process more inclusive and reduce burden on the public exchequer. Transport and Communication sector has been given highest priority with 400 billion rupees followed by energy sector with 237 billion rupees to overcome shortage of power in the country. A substantial amount of 135 billion rupees has been earmarked for social sector, education and higher education 57 billion rupees, Prime Minister’s Youth Program 10 billion rupees, rehabilitation of Temporarily Displaced Persons and Security Enhancement 90 billion rupees and Gas Infrastructure Development Cess 5 billion rupees. An allocation of 62 billion rupees has been made for Special Areas. These include 22 billion rupees for Azad Kashmir, 15 billion rupees for Gilgit-Baltistan and 25 billion rupees for FATA. Ten billion rupees have also been capped for FATA 10-Year Plan. The government has set a target of 6.2 percent of Gross Domestic Product growth for next financial year, with 3.8 percent contribution from agriculture, 7.6 percent from industry and 6.5 percent from services. Industrial sector is targeted to grow by 7.6 percent during next financial year. The target for manufacturing sector is 7.8 percent with Large Scale Manufacturing 8.1 percent and Small Scale, Household Manufacturing 8.2 percent, Construction 10 percent and electricity generation and gas distribution 7.5 percent. The industrial sector is expected to get boost from improved energy supply, public sector expenditure and mega initiatives under CPEC to develop infrastructure, energy resources, roads, railways and bridges. Services sector is targeted to grow by 6.5 percent with 8.3 percent contribution by retail and wholesale trade and transport, storage and communication. Investment target for the next financial year has been kept at 17.2 percent of GDP in order to achieve sustained and inclusive growth. National Savings as percentage of GDP are targeted at 13.1 percent. The Annual Plan envisages domestic crude oil production target at 33.50 million barrels and that of gas at 1.473 TCF. The plan also envisages exploration and development of 90 wells, construction of 10 oil storages and addition of over 1.12 million new connections by gas companies. Power generation capacity of 2270 MW including 450 MW from renewable energy will be added to the national grid. The allocation for next financial year for the mass media sector is over 1644 million rupees. According to the development program, plans for digitalization of Radio Pakistan are being chalked out. Pakistan Broadcasting Corporation is in the process of selection of a digital audio broadcasting standard for the country. Miftah Ismail said despite many difficulties and challenges, the government achieved economic stability over the last five years and took the growth rate to the record level. Highlighting the economic performance of incumbent government, the Finance Minister said GDP ratio remained five point eight percent during the current fiscal year which is the highest in the last thirteen years. He said volume of economy over the last five years has increased to thirty four thousand, three hundred and ninety six billion rupees. Finance Minister said per capita income has increased to over one hundred and eighty thousand rupees. Today, the country has become the twenty fourth biggest economy. He said the agriculture sector grew by three point eight per cent, industrial sector by five point eight per cent and services six point four per cent during the current fiscal year. Miftah Ismail said government also controlled the inflation rate to three point eight per cent. The food inflation remained two per cent. The Finance Minister said key targets of the new budget strategy include real GDP growth rate of six point two percent, inflation below six percent, tax to GDP ratio of thirteen point eight percent, budget deficit of four point nine percent of GDP and net public debt at sixty three point two percent of GDP. The target for foreign exchange reserves for the next year is fifteen billion dollars and social protection programs would continue during the year. He said investments in social protection and prime minister’s youth scheme would continue in the next year. The bill is aimed at giving effect to the financial proposals of the federal government for the year beginning on the first day of July this year and to amend certain laws. The House was adjourned to meet again on Wednesday at 4 p.m.